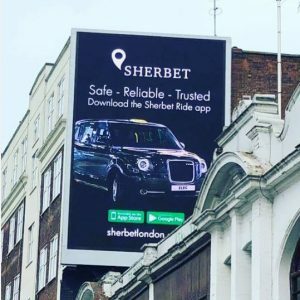 Sherbet London has launched a huge marketing campaign advertising their new Black Taxi App in key areas around the capital. The new app recently launched to both drivers and customers offers a premium service with only TXE, Mercedes Vito and TX4 vehicles available to hire. 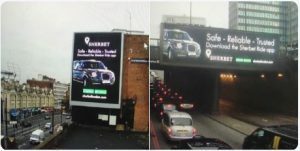 The advertisements can be seen on key billboards which includes the Euston underpass. For the drivers the app features a modern and easy to navigate booking system, with a one touch interface and notification alerts so users can operate more than one application at a time. Drivers will have access to VIP, Corporate, pre-booked and Airport Transfers. their vehicles will be pristine, air conditioned or heated, our drivers smartly dressed, and we’ll offer bottled water to customers on arrival. This is all part of the evolution of our service and brand. Our focus is how we use service excellence and technology to ensure a premium journey experience. Helpful information. Fortunate me I found your web site by chance, and I am surprised why this coincidence didn’t happened in advance! I bookmarked it.